Buy O-rings for your DR350. Good quality + low prices. 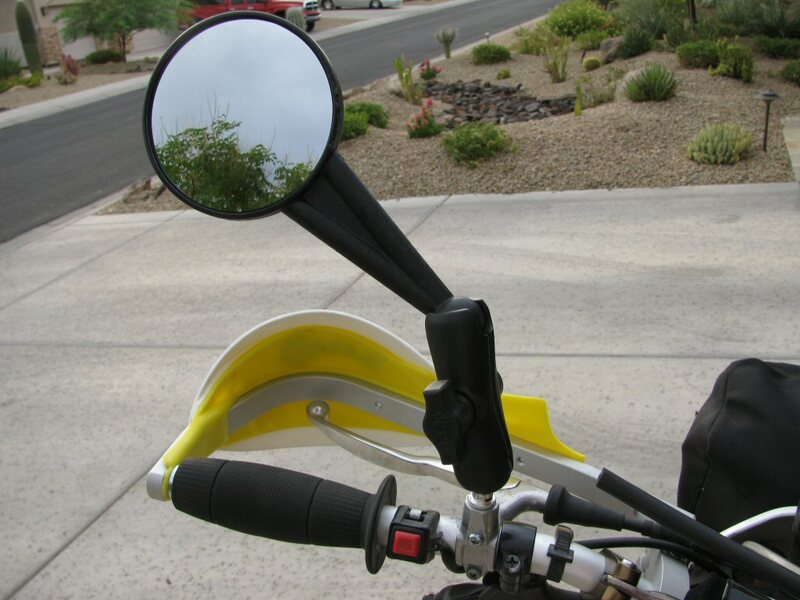 The mirror mounts on the Suzuki DR350 are 10 mm × 1.25 mm. If you are going off pavement, then I would highly recommend a mirror that is not hard/solid mounted. The Acerbis universal mirror is horrible. It will get you through an inspection, but it is hardly worth the effort. Truly junk. For reference, part numbers 2043570001 and 2043580001. These were fit to my DR350 (by the previous owner) when I bought it. I couldn't get rid of them fast enough. The Ken Sean Dual Sport Mirror is a good choice. It is fiddly to set up properly, requiring multiple wrenches, but works pretty well and is inexpensive. After some wear, you'll need to tighten things up again. It is always a bit more trouble than I would like to get just the right amount of pressure so it isn't too tight, but not so little as to permit it to jiggle out of position. I swapped out my Ken Sean mirror for a ram mount mirror from my friend Mike Sonzini. Total cost is about $50 for the mirror and ram mounts, so it isn't nearly as inexpensive. However, it is very easily adjustable without tools, holds it's position very well, and moves out of the way easily when bumped. So far, it is a better mirror and I like it. 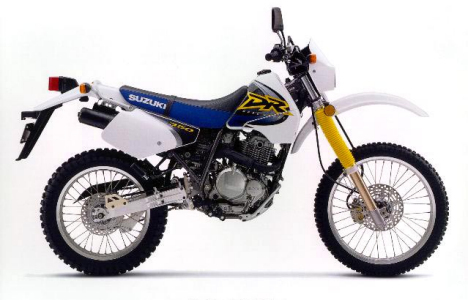 FYI, my DR350 (dirt) model did not come with a threaded mount on the clutch perch for a mirror. 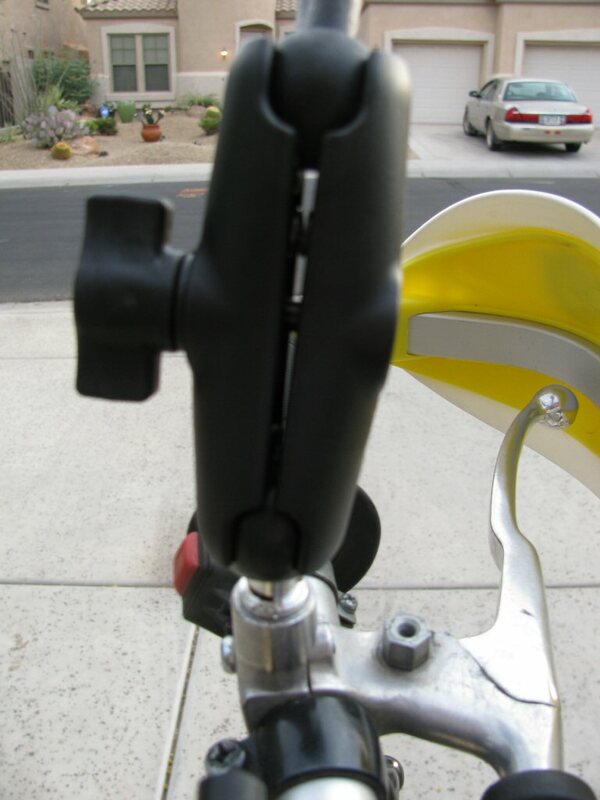 But the threaded clamp piece from a street model fits perfectly and is inexpensively available from Suzuki. I carry the original non-threaded clamp in case I destroy the other one in a wreck. I do not fit any mirror on the right front brake perch because I do not wish to risk damaging or destroying the master cylinder. One mirror is enough. 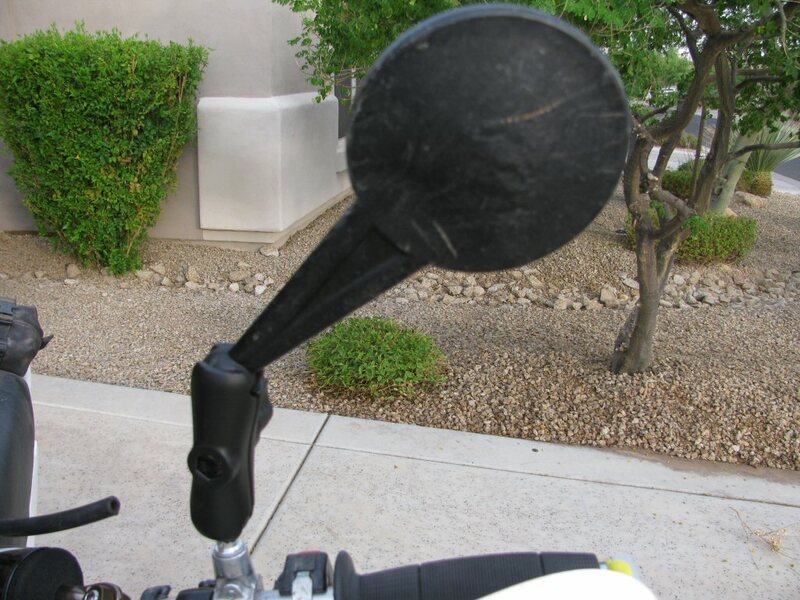 Ram mount mirror fit to a 1993 Suzuki DR350 motorcycle.